Running back Knowshon Moreno, out the past three weeks with an elbow injury, is practicing today at least on a limited basis. He hopes to play on Sunday against Green Bay although no final determination has been made on that front. I highly doubt he plays with that elbow. Smoke screen so the Pack has to prepare and if he does play, his elbow is a big target. But if he is healthy, he and Miller should get 15 touches a piece against that sorry run D.
### As we told you last week, Knowshon Moreno was indeed joking when he told reporters he would be out another month. He practiced today with a protective covering on his elbow and hopes to play Sunday, though he's still not 100 percent. Run the ball all day and keep Rodgers on ice. Would be huge if he played. He is a bit of an oddball, I don't think we can rely on what Moreno says. I wondered about this. One thing this team does not need are fumbles. ### Knowshon Moreno said today that trying to carry the ball with a brace on his dislocated elbow "hasn't worked that well," but he wouldn't rule out playing Sunday. This elbow is a real problem for Moreno. Think about it. Pass pro and receiving are two of the reasons we brought him in. Can he be effective in those areas, especially pass pro? If you're just going to use him on running downs, how long will it take before GB figures that out? I'm skeptical. I can see using him to spell Miller, maybe 8-10 touches max. I was thinking if he's in the game it is definitely a run.... can he pass block? Just talked to #Dolphins RB Knowshon Moreno. He said brace an issue. I asked what's the biggest complication w/it? Moreno said "everything." He's on my fantasy team and staying on the bench - I really don't expect him to play this week. Good choice Misshell. If he needs a brace, how is gonna hold the ball? Pass block? No way IMO...If I'm playing defense, I'm hitting the elbow all day. I believe I heard on NFL Network today that he was listed as probable to play. And he didn't run the same before the elbow injury, he was scared as he should have been. I can see using him to spell Miller, maybe 8-10 touches max. Pretty close. He had 7 touches. 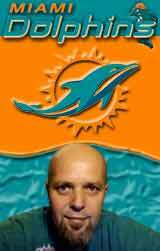 Imo he should not have suited up for this game with that big brace on his arm, smacks of desperation on the Dolphins.